February 15, 2007 - One of Canada's pre-eminent Inuit artists, a woman whose work has earned huge acclaim in Europe and the U.S., spends her time on Rideau Street these days, peddling her pencil-crayon drawings to passersby for cigarette money. She usually produces one drawing a day. But it is sad to see how little the shy, diminutive artist accepts for a drawing — $25, maybe $30. Her earlier work, from her days in Cape Dorset, Baffin Island, sells for $1,600 to $2,600 per drawing at Feheley Fine Arts, the Toronto art gallery that kick-started her ascent a decade ago. But even sadder is the thought of the destitute woman — currently five months pregnant — curling up at night in a bushy area overlooking the Rideau River. 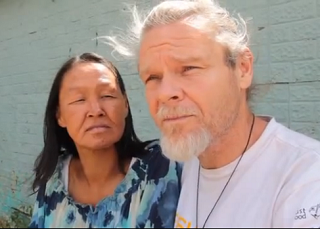 Pootoogook, 43, and her boyfriend, William Watt, 49, have been living outdoors in various secluded spots in and around Lowertown since spring after spending the winter in shelters for the homeless. Originally posted on February 15, 2007.